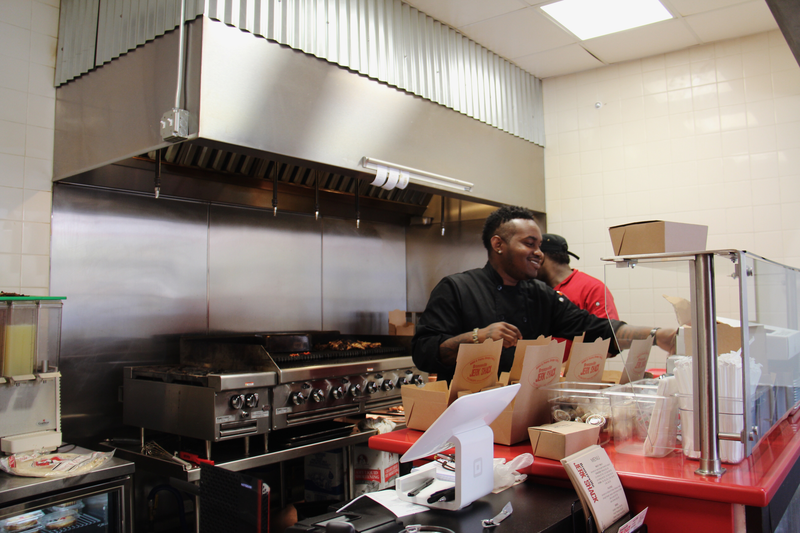 Bronzeville Jerk Shack, the first Bronzeville Cookin’ venue, opens. I’m not patient at all,” says Bernard Loyd, the man who has dedicated the last twelve years of his life to the commercial and culinary redevelopment of a three-block stretch of 51st Street. I met with him recently to talk about Bronzeville Cookin’, his company Urban Juncture’s project of transforming the area surrounding the 51st Street Green Line stop into a hub of black culture and cuisine, and the Bronzeville Jerk Shack, its first and most recently realized venue. Though patience be not one, Loyd’s other traits—“something more along the lines of perseverance…no, persistence”—have clearly been fundamental to the realization of the Jamaican roadhouse-inspired spot, which has finally opened after years of talk. Originally slated for 2010, then 2014, the restaurant finally opened in September 2015. Given uncertain funds and a hard-hitting recession, the years-long delay certainly came as no surprise, least of all to Loyd and his team; but the wait, it seems, was well worth it. 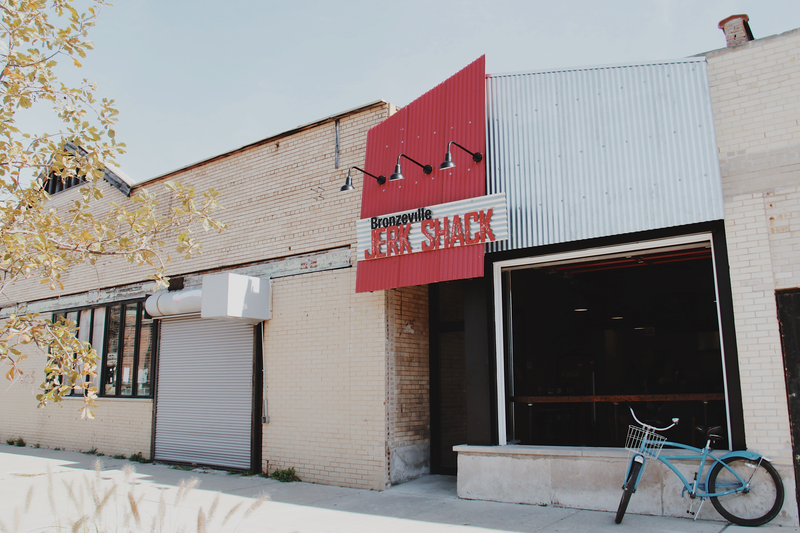 The Jerk Shack’s entrance is at 5055 S. Prairie Ave., one hundred feet or so north of 51st. So long as the restaurant is open and the weather pleasant, the storefront windows are drawn up, allowing the occasional breeze to float in along with voices from the street and the familiar ding of Green Line trains’ closing doors. Inside, the earth tones and exposed brick wall harmonize with the metallic and red highlights of the counters and windows. Several dark wooden chairs and tables, some mismatching, were salvaged from the Bronzeville Forum on 43rd Street, another of Loyd’s properties, and restored to gleaming glory. Shining on the wall is a mosaic of a loggerhead kingbird, a native Jamaican species, made and donated by acclaimed Bronzeville artist Carolyn Elaine. The menu, the Jerk Shack’s most important feature, isn’t extensive, but once you’ve tasted the jerk chicken dinner you really don’t mind. The meat has an unabashed, smoky, make-you-cry kick to it that only the combination of sweet sorrel juice, soft fried plantains, and a couple minutes’ time will soothe. Depending on your tolerance for spice, you may or may not wish to coat your plate with the extra container of jerk sauce that comes with each order. The chicken is tender, though it doesn’t quite want to fall off the bone, and juicy enough that I couldn’t get through the meal without replenishing the napkin stack about halfway through. Included with the jerk plates, which are either chicken- or pork-based, is a tauntingly small portion of soft, sweet “Hellshire Beach” festival (Jamaican cornbread fritters), as well as a slice of hard dough bread. Sides include saltfish fritters, sweet potato fries that have already gathered acclaim on Yelp, and fried plantains. Every day customers can also order a special item not on the official menu; I found a jerk shrimp plate on the specials chalk board one day, a jerk chicken wrap the next. Pierre Johnson, the Shack’s head chef and manager, grew up in Bronzeville and developed a feel for the kitchen by trying to surprise his mother with dinner on days when she would return home late from work. The cooking fever took over during a culinary arts class at Dunbar Academy, and he later honed his craft in New York, at the Culinary Institute of America. How he ended up as the chef of the Bronzeville Jerk Shack reads like a work of fate. He spent several years of touring around the world as a chef for Live Nation, preparing meals for the massive tour groups accompanying the likes of Kanye West. Five years ago, stepping off the One Direction tour bus in his home city, just outside Soldier Field, Johnson snapped his ankle and returned home to rest up. Loyd was set on his idea of a Jamaican roadhouse-style spot, but allowed Johnson to make the Shack his own. So Johnson decided the menu, which needs work, he says—he didn’t grow up cooking Jamaican cuisine and is making adjustments as he goes. He does import the pimento leaves and wood over which the meat is grilled and hibiscus flowers for the sorrel juice directly from Jamaica. Johnson keeps the recipes for both the marinade and the sorrel juice a secret. But a tour of the rooftop farm, installed in May and from which flowers and vegetables are already sprouting, reveals that he currently employs some powerful ingredients that he hopes will come from the garden next season: Caribbean scotch bonnet peppers dwell among other breeds of pepper, garlic, cilantro, and onions; more mild produce like carrots, tomato, chard, kale, and hibiscus also stretch their roots deep into specialized layers of fleece and soil. Though the rooftop farm was installed too late to provide the Jerk Shack with its ingredients this year, Urban Juncture’s Director of Garden Initiatives Latrice Williams said that, after wintering the garlic and figuring out the rotation schedule, they could expect to have produce flowing from the roof into Chef Pierre’s kitchen by next season. Material will travel in the opposite direction, too; all leftover food and waste will be composted and sent back up to the roof, or to the Bronzeville Community Garden down the road, to fertilize the gardens and keep the system as close to zero-waste as possible. Urban Juncture, Loyd’s umbrella development company overseeing the Bronzeville Cookin’ project, professes to be a company with a focus on sustainability, and a tour of the facilities, those both up-and-running and in-the-works, seems to prove it. The Bronzeville Community Garden on 51st and Calumet, the first of Loyd’s projects on 51st, is now five years old. Between patches of tomatoes and lettuce, the only two vegetables still in season in early October, the garden plays host to neighborhood chess enthusiasts and lunch-eaters, gardeners and children, and every so often hosts a chef for healthy cooking demonstrations. “Food brings people together,” Loyd says. “If we can inject food, quality food, into the area, then we’ll be able to feed people quality food, encourage people to come back [to Bronzeville], and bring jobs into the area as well.” His priorities throughout redevelopment lie in the culinary arts, conservation, and culture, he told me. 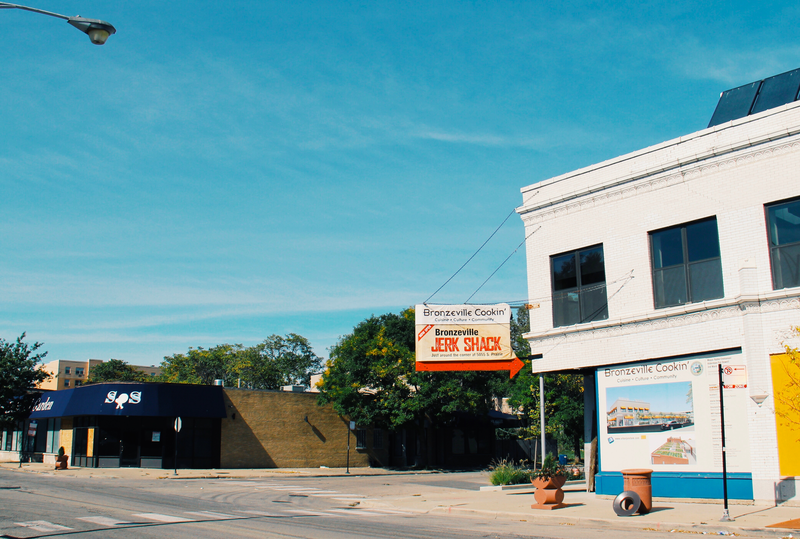 Bronzeville residents can expect to see far more in the future from Loyd and his team. One produce market and three restaurants serving distinct African and African-American cuisine—one serving southern-style breakfast, one vegetarian fare, and one smokehouse and grill—will follow the Jerk Shack if all goes according to plan and people step forward as equity partners. Of course, not all does go as planned in the world of developing and in the city of Chicago. “We’ve learned that it’s better not to become too attached to timelines,” Loyd laughed. Applying for funds and business permits from the city is not always a timely process; even more trying is the $400,000 grant promised to Urban Juncture by the state of Illinois that was delayed due to the ongoing budget crisis. Nonetheless, the company’s partnership with the city, which has also sold two adjoining properties on 51st at a low rate to Loyd, has been invaluable. After the recession hit, Urban Junctures lost all of its financial partners but two: the city and the Chicago Community Loan Fund. Although the recession hit them hard, Loyd says that the concept of using a cultural platform for development in Bronzeville became even more powerful after 2009. The next, albeit less-publicized, venue of the 51st Street redevelopment project will be an incubator on the second floor of the building next to the Jerk Shack, which is expected to open in late November. Loyd envisions it as a space not only for growing local entrepreneurs and businesses, but also as a place where individuals can rent space that allows them to work in a professional setting without commuting to their offices. Looking at what Loyd has on his metaphorical plate—on top of the continuation of the 51st Street developments, Loyd has committed himself to restoring the deteriorating Bronzeville Forum, which he purchased four years ago—one would wonder whether his plans might be overly ambitious, if it weren’t for his easy, confident demeanor and the extensive architectural plans that neatly cover most of his office. Johnson hasn’t taken a day off since starting at the Jerk Shack, and Loyd hasn’t taken a paycheck for the last twelve years. Shared by the two and everyone employed by Urban Juncture is a passion for their work and their neighborhood, and a desire to do things right, even if it takes longer than originally planned.